To Cite: Lopes C R, Harley Crisp A, Schoenfeld B, Ramos M, Diego Germano M, et al. Effect of Rest Interval Length Between Sets on Total Load Lifted and Blood Lactate Response During Total-Body Resistance Exercise Session, Asian J Sports Med. 2018 ; 9(2):e57500. doi: 10.5812/asjsm.57500. Objectives: This study aimed to investigate the effect of different rest interval durations between sets during full-body resistance exercise sessions on total load lifted and blood lactate concentrations in resistance-trained individuals. Methods: Ten healthy young men (age: 23 ± 6.5 years; total body mass: 82.8 ± 10.6 kg, height: 177.3 ± 0.1 cm) randomly performed 3 resistance exercise sessions with different rest intervals between sets (30 seconds, 60 seconds and 120 seconds). The resistance exercise sessions consisted of 6 full-body exercises (bench press; seated low row; shoulder press; back squat; leg press 45° and seated calf raise) performed with 4 sets of 10 repetitions maximum (RM). Total load lifted (sets × repetitions × load (Kgf)) and lactate blood concentration were determined for each exercise session. One way, repeated measures analysis of variance (ANOVA) followed by Bonferroni’s post-hoc test were used for multiple comparisons. Results: The total load lifted was significantly (P < 0.001) lower for 30 seconds (26382.0 ± 4100.3 kg) rest interval compared with 60 seconds (28864.5 ± 4139.7 kg) and 120 seconds (30064.4 ± 3966.4 kg). The blood lactate response was not different among the 3 rest interval conditions investigated, with mean peak values of 7.05 ± 1.69, 7.26 ± 2.77 and 6.90 ± 3.79 mM for 30 seconds, 60 seconds and 120 seconds, respectively. Conclusions: In conclusion, rest interval durations of 60 seconds and 120 seconds between sets favored a higher total load lifted in the exercise session when compared to the 30 seconds rest interval. The rest protocols implemented in the present study promoted a similar metabolic response (e.g. blood lactate concentration) to a full-body resistance exercise session in trained subjects. Resistance training is recognized as an effective tool for enhancing strength, power and muscular endurance (1, 2). However, the successful resistance training prescription involves a proper interaction among several acute training variables, such as choice and order of exercises, load intensity, volume, rest interval (between sets, exercises and sessions), muscle actions, velocity of contraction and frequency (1, 3). Among these training variables, evidence has suggested that the rest interval between sets affects various acute responses including metabolic (4, 5), hormonal (6-9), cardiovascular (10-12), neuromuscular and perceived ratings of exertion (13, 14). Thus, the rest interval between sets can be considered a key variable for resistance training prescription, since it affects distinct acute responses, which in turn could modulate chronic neuromuscular adaptations (8, 15, 16). Adequate rest interval duration between sets is necessary to restore the anaerobic alactic system and remove metabolic by-products (such as hydrogen ions, inorganic phosphate), delaying muscle fatigue and thus favouring a higher external training load during resistance exercise. In this context, previous studies indicate that shorter rest intervals result in a decrement in the number of repetitions performed during multiple sets of isolated exercises (5, 17-20). However, few studies have investigated the influence of rest interval duration on the number of repetitions performed during a complete resistance training routine in resistance-trained individuals (21-23). Briefly, Miranda et al. (22) reported that a 60 seconds rest interval resulted in a lower number of repetitions performed during resistance exercise session for upper body (3 sets 8 repetitions for 6 exercises) than 180 seconds. Comparing 120 seconds and 300 seconds rest interval (3 sets of 10 repetitions for 3 exercises) during a lower body resistance exercise session, Senna et al. (23) reinforced the negative influence of a shorter rest interval on total number of repetitions performed. On the other hand, no study to date has investigated the effects of rest interval between sets during a complete full-body resistance exercise session in trained subjects. Considering that rest interval is crucial to promote proper recovery (e.g. restore anaerobic alactic system and remove metabolic by-products), it is important to investigate its effects on metabolic responses such as blood lactate concentration. Blood capillary lactate analyses are considered a simple measure that indicate the glycolytic anaerobic system contribution and indirectly, metabolic stress. In this way, previous studies (4, 13, 24) have demonstrated no influence on blood lactate level comparing moderate rest interval between sets (ranging from 60 seconds to 240 seconds). However, limited evidence exists about the effects of very short (< 60 seconds) versus moderate rest intervals between sets on the blood lactate response. Another important aspect that has been neglected is the influence of rest interval on total load lifted (TLL) during resistance training. The TLL represents the sum of number of sets, repetitions and external load lifted during a resistance exercise session. Evidence indicates that TLL influences muscle damage (25), hormonal (26) and muscle thickness (27) responses to resistance training. Therefore, TLL represents an important outcome beyond simply the reduction in the number of repetitions performed as commonly reported in some studies that investigate rest interval between sets (19, 28-32). Previous data support the assumption that resistance-trained individuals can tolerate shorter rest interval lengths between sets and maintain the external training load in a better manner than untrained and novice individuals (33). Thus, it is possible that a better interaction between inter-set rest interval and TLL during full-body workouts could maximize the training stimulus for the resistance-trained, resulting in improved outcomes. Although it is not possible to extrapolate the results of an acute resistance training response to chronic neuromuscular adaptations, the knowledge of resistance exercise session characteristics (metabolic and mechanic) affected by rest interval provide insights into factors that can influence post-exercise adaptations and can thus assist strength and conditioning coaches to prescribe training according to periodization phase. Thus, the purpose of this study was to determine TLL and blood lactate responses to rest intervals of varying durations. The authors hypothesized that TLL would be greater during 120 seconds rest interval and blood lactate concentration would be higher during 30 seconds rest interval in resistance-trained individuals. The current study aimed to investigate the effect of different rest interval durations between sets during full-body resistance exercise sessions on TLL and blood lactate concentration. Ten young men (age: 23 ± 6.5 years; total body mass: 82.8 ± 10.6 kg, height: 177.3 ± 0.1 cm) experienced in resistance training (3.1 ± 2.2 years) volunteered to participate in this study. The inclusion criteria for participation were: a, at least 2 years of continuous experience in resistance training; b, performing at least 3 resistance exercise sessions per week. The exclusion criteria were: a, having previous injury that may interfere with resistance exercises; b, self-reported use of anabolic steroids; and c, using nutritional supplements containing creatine. A study-power analysis suggested that 10 subjects was an adequate sample size to meet effect size of 1, alpha level of 0.05 and a power (1-β) of 80. This study was approved by the Piracicaba Methodist University (SP, Brazil) research ethics committee (protocol number: 19/13) and all subjects read and signed an informed consent document. A cross-sectional randomized design was employed to compare the effects of different inter-set rest intervals on TLL and acute lactate response to a full-body resistance exercise in resistance-trained men. Initially, all subjects attended the laboratory to determine 10 repetitions maximum (10RM) for each proposed resistance exercise in the study. After 48 hours, subjects returned to the laboratory 3 times to randomly perform the resistance exercise sessions with a different rest interval between sets. The inter-set rest intervals investigated were: 30 seconds, 60 seconds and 120 seconds. Resistance exercise sessions were separated by 48 hours. The total load lifted (TLL) was calculated for each exercise bout. In addition, a capillary blood sample was collected to determine blood lactate concentration at specific time-points: pre (baseline), during (after the 3rd exercise), after the last exercise, as well as 5 and 10 minutes after the resistance exercise session. The subjects were instructed to keep their normal daily eating and activity habits. Each resistance exercise session consisted of 6 exercises targeting the upper and lower body musculature (bench press, seated low row, shoulder press, back squat, leg press 45° and seated calf raise) performed with 4 sets of 10 repetition maximum (RM). Range of motion was standardized for all exercises and the cadence was 2 seconds for negative and positive phase. A metronome was set at 60 beats per minute to assist the subjects in controlling the velocity of movement execution. The difference between exercise sessions was the manipulation of inter-set rest intervals: 30 seconds, 60 seconds or 120 seconds. In case of a performance decrement (reduction in the number of repetitions) during the sets, the external load was adjusted, aiming to maintain the repetition zone intensity of 10RM. The subjects were verbally encouraged and motivated by the research staff to make maximal efforts during resistance exercise sessions. The resistance training sessions were individually supervised by personal trainers to ensure that the target 10RM was achieved in all exercises 4 sets of 10RM for each exercise was chosen because this is a common protocol in resistance training routines. All measures were performed at the same approximate time of day, between 6 pm and 10 pm. The 10RM test was performed to determine intensity load for the exercises: a, bench press; b, seated low row; c, shoulder press; d, back squat; e, leg press 45° and f, seated calf raising. Briefly, the subjects performed a warm up of 3 sets of 10 repetitions at ~ 40% - 60% of the estimated 10RM before the beginning of the 10RM test. Thereafter, all subjects were instructed to perform 10 repetitions until concentric failure. The load was adjusted ~ 10%, if the subject did not complete 10RM with proper lifting technique. Two spotters were present to observe the lifting technique and to ensure the subjects’ safety. The protocol was performed with a maximum of 5 attempts and a rest interval of 180 seconds was afforded between each attempt. The rest interval between exercises was 300 seconds. All subjects were familiarized with the resistance exercise in this study. Subjects reported that they performed 3 to 5 sets and 8 to 12 repetitions during the course of their normal resistance training programs. The TLL was determined in all resistance exercises according to the formula: TLL = number of sets × number of repetitions × external load (kg). The TLL data are expressed in kg. Blood sample (25 µL) was collected into heparinized capillary tubes and stored into tubes containing (50 µL) sodium fluoride at 1%. Blood lactate was analyzed by YSI 2300 Stat Analyzer (Yellow Springs Instruments, USA) and concentration is expressed in mMoles. The normality and homogeneity were assessed by Shapiro Wilk and Levene’s tests, respectively. One way, repeated measures analysis of variance (ANOVA) followed by Bonferroni’s post-hoc test were used for comparisons between experimental conditions. Cohen’s formula for effect size (ES) was calculated (Mean 1 - Mean 2 / pooled standard deviation), and the results were based on the following criteria: < 0.35 trivial effect; 0.35 - 0.80 small effect; 0.80 - 1.50 moderate effect; and > 1.5 large effect, for recreationally resistance-trained, according to Rhea (34). Data are expressed as mean ± standard derivation (SD). An alpha of 0.05 was used to determine statistical significance. Figure 1 shows TLL between resistance exercise sessions. The TLL was significantly (P < 0.001) lower for 30 seconds (26382.0 ± 4100.3 kg) compared with 60 seconds (28864.5 ± 4139.7 kg; ES = 0.60) and 120 seconds (30064.4 ± 3966.4 kg; ES = 0.91) rest interval bouts. There was no significant difference (P > 0.05; ES = 0.29) between 60 seconds and 120 seconds rest intervals. Figure 1. Total load lifted (mean ± SD) in kilograms. * Significant difference P < 0.01) compared to 30 seconds rest interval between sets. # Significant difference (P < 0.001) compared to 30 seconds rest interval between sets. Blood lactate response showed a similar increase (P < 0.001) compared to the baseline value for all conditions (30 seconds, 60 seconds and 120 seconds). However, no significant interaction (P > 0.05) between conditions was observed. In addition, peak blood lactate concentration did not differ (P = 0.90) among all resistance exercise sessions, with mean values of 7.05 ± 1.69, 7.26 ± 2.77 and 6.90 ± 3.79 mMoles for 30 seconds, 60 seconds and 120 seconds, respectively. This study aimed to investigate the effect of 3 different inter-set rest interval durations during total-body resistance exercise session on TTL and blood lactate concentration in resistance-trained individuals. The main findings were: a, the 30 seconds rest interval between sets yielded a significantly lower TLL compared to 60 seconds and 120 seconds rest intervals; and b, the magnitude of blood lactate response was the same among the rest intervals investigated. Thus, the initial hypothesis of this study was partially confirmed, since the moderate rest intervals (60 and 120 seconds) investigated result in higher TLL. However, contrary to the initial hypothesis a similar blood lactate concentration was observed for all rest intervals. It is well recognized that mechanical and metabolic stress imposed during resistance training is a primary stimulus to adaptive skeletal muscle response (35). Specifically, the length of the rest interval between sets directly affects phosphocreatine (PCr) resynthesis, proton buffering and removal of metabolic byproducts (9). Thus, it is expected that a very short rest interval between sets would induce an incomplete muscular recovery, theoretically maximizing metabolic stress and reducing performance. In this context, previous studies confirm that longer rest intervals (> 180 seconds) result in a higher number of repetitions performed (6, 13, 19, 22). For instance, Miranda et al. (22) observed a lower number of repetitions completed for 60 seconds compared to 180 seconds inter-set rest intervals when performing 5 upper body resistance exercises at 3 sets of 8RM. Additionally, Senna et al. (23) compared 120 seconds and 300 seconds rest intervals of 3 lower body resistance exercises (3 sets of 10RM) and found a higher number of repetitions for the 300 seconds rest interval condition. Thus, longer rest intervals must be used when the goal is to perform a higher volume of training with a given external load during a resistance training session. Hernandez Devo et al. (36) compared the effect of 3 different rest intervals (1, 2, and 3 minutes) on mechanical, physiological, and perceptual responses in young men and women and reported that resting 1 minute between sets impaired all assessed parameters. Interestingly, Hernandez Devo et al. (36) stratified the study sample into stronger and weaker subjects and observed that stronger subjects could maintain power output using a 2-minutes rest interval while weaker subjects required a long rest interval to maintain power output. De Salles et al. (37) investigated the influence of rest intervals on the number of repetitions by comparing the effect of fixed versus self-selected RI between sets in lower and upper body exercise performance. Results showed a similar reduction in the number of repetitions between 2 minutes and self-selected rest intervals (1 to 3 minutes). On the other hand, short or intermediate rest intervals are commonly used in bodybuilding-type protocols to maximize hormonal response, body composition profile and muscle hypertrophy (38). Scudese et al. (39) examined examine the influence of rest period duration (1 vs. 3 minute between sets) on acute hormone responses to a high-intensity and equal volume bench press workout. These researchers found that both short and long rest periods enhanced the acute testosterone response, however, the longer rest interval promoted a longer-lasting elevation for both free and total testosterone. Although the manipulation of rest intervals may positively alter the anabolic hormonal response, it remains questionable whether this favorable hormonal milieu translates into a greater rate of protein synthesis or muscle hypertrophy. In fact, Mckendry et al. (40) showed that a 1 minute rest interval between sets of moderate-intensity, high-volume resistance exercise blunted the acute anabolic intracellular signaling response that modulates protein synthesis compared with a longer rest period (5 minutes), despite a superior circulating hormonal setting. In regard to body composition, Villanueva et al. (16) compared the effect of short (1 minute) versus long (4 minutes) rest intervals on body composition and strength in trained older men. A greater enhancement in body composition, muscular performance, and functional performance was demonstrated with the shorter rest interval, compared to the same RT prescription with extended rest interval, in older men. The current study investigated the effect of a short (30 seconds) and 2 moderate (60 and 120 seconds) rest interval between sets. The current results show that the 30 seconds rest interval reduced TLL by 9.4% and 14.0% versus the 60 seconds and 120 seconds rest intervals, respectively. Furthermore, no differences were evident (trivial effect size) between 60 seconds and 120 seconds rest interval between sets (Figure 1). This finding indicates that both moderate rest intervals investigated allowed higher external training load (e.g. TLL) compared to the short rest interval in resistance-trained men. In agreement with the current results, Rahimi (19) reported no difference between moderate inter-set rest interval (60 seconds, 90 seconds and 120 seconds) on the number of repetitions completed over 4 sets of squat exercise performed to muscular failure (85% 1RM). Furthermore, a study conducted by Willardson and Burkett (31), also indicated no difference between 60 seconds and 120 seconds rest intervals on the total number of repetitions performed over 4 sets of bench press and back squat exercise using an 8RM external load. The present study expands on these findings to show that TLL was similar between 60 seconds and 120 seconds rest interval during a full-body resistance exercise session (6 exercises). Lactate is a metabolite formed in anaerobic glycolysis, and its concentration is increased in the bloodstream during high-intensity exercises (41). In the current study, the analysis of blood lactate concentration post-exercise (pre to 10-minutes) and the observed peak values indicates a relevant reliance on glycolysis as an energy pathway. However, no significant difference was found for blood lactate response between the short and moderate rest intervals investigated (Figure 2). These data indicate that the magnitude of anaerobic glycolytic pathway activation was similar between the rest interval of 30 seconds, 60 seconds and 120 seconds for resistance-trained men. Figure 2. Blood lactate concentration (mean ± SD) at times: pre-exercise (PRE), immediately after the third exercise (3EX), immediately after the last exercise (6EX), 5 (POST5) and 10 minutes (POST10) after resistance exercise session. * Significant difference (P < 0,001) compared to pre values. This result is contrary to the initial hypothesis that blood lactate concentration would be higher during 30 seconds rest interval between sets due to lower PCr resynthesis capacity. In this study, the 30 seconds rest interval between sets induced a greater level of fatigue as reflected by the lower TLL. Therefore, it is reasonable to speculate that the higher TLL performed in the 60 seconds and 120 seconds conditions required a relevant participation of the glycolytic energy system, as a result matching the metabolic stress mimicked by the short interval rest recovery. The current results contradict those of Rogatzki et al. (42), who reported a greater blood lactate concentration for short rest intervals during a muscular endurance protocol (2 sets of 20 repetitions at 53% of 1RM and 45 seconds rest interval) versus long rest intervals during a maximum strength protocol (5 sets of 5 repetitions at 85% 1RM with 180 seconds rest interval) of back squat exercise. The Rogatzki et al. (38) findings’ suggest that differences in blood lactate response may be more related to the difference in the numbers of repetitions than rest interval, although the TLL was not different between conditions (42). In agreement with the current findings, Rahmi et al. (9) investigated the effects of 3 intermediate rest intervals (60 seconds, 90 seconds and 120 seconds) in squat and bench press exercises (4 sets 85% 1RM to muscular failure) in resistance-trained men and found no significant difference in blood lactate post-exercise between conditions. Similarly, Hiscock et al. (24) also observed no significant change for blood lactate comparing 120 seconds and 240 seconds rest intervals between sets during single biceps curls exercise (3 sets at 70% 1RM to muscular failure) in recreationally trained men. It should be noted that in Rahmi et al.’s (9) and Hiscock al.’s study (24), the TLL were also not different between conditions. These results (9, 24) are consistent with the current study that indicates 60 seconds and 120 seconds rest intervals with TLL equated results in a similar blood lactate response. In conclusion, the rest internal durations of 60 seconds and 120 seconds between sets favored a higher TLL and induced a similar blood lactate response compared to short rest interval of 30 seconds, during a full-body resistance exercise session in resistance-trained subjects. Given that 30 seconds rest reduced TLL without increasing metabolic stress - 2 factors that have been shown to enhance anabolism - it can be inferred that such a short rest period may be detrimental to long-term neuromuscular adaptations in resistance-trained men. Thus, practitioners should employ rest periods of at least 1 minute in duration when the goal is to maximize muscle strength and hypertrophy. 1. American College of Sports M. American College of Sports Medicine position stand. Progression models in resistance training for healthy adults. Med Sci Sports Exerc. 2009;41(3):687-708. doi: 10.1249/MSS.0b013e3181915670. [PubMed: 19204579]. 2. Kraemer WJ, Ratamess NA. Fundamentals of resistance training: progression and exercise prescription. Med Sci Sports Exerc. 2004;36(4):674-88. doi: 10.1249/01.MSS.0000121945.36635.61. [PubMed: 15064596]. 3. Padulo J, Mignogna P, Mignardi S, Tonni F, D'Ottavio S. Effect of different pushing speeds on bench press. Int J Sports Med. 2012;33(5):376-80. doi: 10.1055/s-0031-1299702. [PubMed: 22318559]. 4. Martorelli A, Bottaro M, Vieira A, Rocha-Junior V, Cadore E, Prestes J, et al. Neuromuscular and blood lactate responses to squat power training with different rest intervals between sets. J Sports Sci Med. 2015;14(2):269-75. [PubMed: 25983574]. [PubMed Central: PMC4424454]. 5. Ratamess NA, Falvo MJ, Mangine GT, Hoffman JR, Faigenbaum AD, Kang J. The effect of rest interval length on metabolic responses to the bench press exercise. Eur J Appl Physiol. 2007;100(1):1-17. doi: 10.1007/s00421-007-0394-y. [PubMed: 17237951]. 6. Ahtiainen JP, Pakarinen A, Alen M, Kraemer WJ, Hakkinen K. Short vs. long rest period between the sets in hypertrophic resistance training: influence on muscle strength, size, and hormonal adaptations in trained men. J Strength Cond Res. 2005;19(3):572-82. doi: 10.1519/15604.1. [PubMed: 16095405]. 7. Bottaro M, Martins B, Gentil P, Wagner D. Effects of rest duration between sets of resistance training on acute hormonal responses in trained women. J Sci Med Sport. 2009;12(1):73-8. doi: 10.1016/j.jsams.2007.10.013. [PubMed: 18093876]. 8. Buresh R, Berg K, French J. The effect of resistive exercise rest interval on hormonal response, strength, and hypertrophy with training. J Strength Cond Res. 2009;23(1):62-71. doi: 10.1519/JSC.0b013e318185f14a. [PubMed: 19077743]. 9. Rahimi R, Qaderi M, Faraji H, Boroujerdi SS. 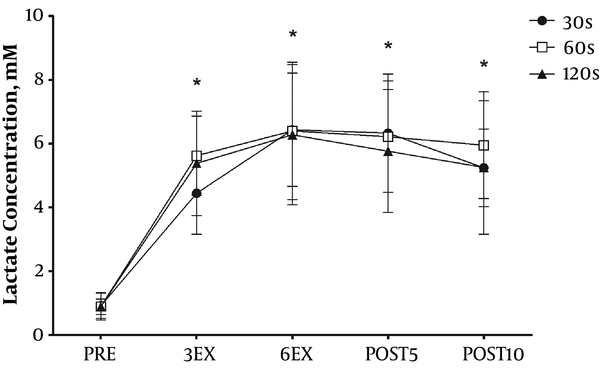 Effects of very short rest periods on hormonal responses to resistance exercise in men. J Strength Cond Res. 2010;24(7):1851-9. doi: 10.1519/JSC.0b013e3181ddb265. [PubMed: 20555276]. 10. Castinheiras-Neto AG, Costa-Filho IR, Farinatti PT. [Cardiovascular responses to resistance exercise are affected by workload and intervals between sets]. Arq Bras Cardiol. 2010;95(4):493-501. doi: 10.1590/S0066-782X2010005000119. [PubMed: 21180785]. 11. de Salles BF, Maior AS, Polito M, Novaes J, Alexander J, Rhea M, et al. Influence of rest interval lengths on hypotensive response after strength training sessions performed by older men. J Strength Cond Res. 2010;24(11):3049-54. doi: 10.1519/JSC.0b013e3181ddb207. [PubMed: 20940639]. 12. Lima AHRA, Forjaz CLM, Silva GQM, Lima APA, Lins Filho OL, Cardoso Júnior CG, et al. Effect of rest interval on cardiovascular responses after resistance exercise. Motriz Rev Educ Fís. 2013;19(2):252-60. doi: 10.1590/s1980-65742013000200002. 13. Senna GW, Figueiredo T, Scudese E, Baffi M, Carneiro F, Moraes E, et al. Influence of different rest interval length in multi-joint and single-joint exercises on repetition performance, perceived exertion, and blood lactate. J Exerc Physiolonline. 2012;15(5):96-106. 14. Tibana RA, Vieira DC, Tajra V, Bottaro M, de Salles BF, Willardson JM, et al. Effects of rest interval length on Smith machine bench press performance and perceived exertion in trained men. Percept Mot Skills. 2013;117(3):682-95. doi: 10.2466/06.30.PMS.117x27z2. [PubMed: 24665790]. 15. Schoenfeld BJ, Pope ZK, Benik FM, Hester GM, Sellers J, Nooner JL, et al. Longer Interset Rest Periods Enhance Muscle Strength and Hypertrophy in Resistance-Trained Men. J Strength Cond Res. 2016;30(7):1805-12. doi: 10.1519/JSC.0000000000001272. [PubMed: 26605807]. 16. Villanueva MG, Lane CJ, Schroeder ET. Short rest interval lengths between sets optimally enhance body composition and performance with 8 weeks of strength resistance training in older men. Eur J Appl Physiol. 2015;115(2):295-308. doi: 10.1007/s00421-014-3014-7. [PubMed: 25294666]. 17. Kraemer WJ. A series of studies—the physiological basis for strength training in American Football: Fact over philosophy. J Strength Cond Res. 1997;11(3):131-42. doi: 10.1519/1533-4287(1997)011<0131:asostp>2.3.co;2. 18. Matuszak ME, Fry AC, Weiss LW, Ireland TR, McKnight MM. Effect of rest interval length on repeated 1 repetition maximum back squats. J Strength Cond Res. 2003;17(4):634-7. doi: 10.1519/00124278-200311000-00002. 19. Rahimi R. Effect of different rest intervals on the exercise volume completed during squat bouts. J Sports Sci Med. 2005;4(4):361-6. [PubMed: 24501549]. [PubMed Central: PMC3899651]. 20. Richmond SR, Godard MP. The effects of varied rest periods between sets to failure using the bench press in recreationally trained men. J Strength Cond Res. 2004;18(4):846-9. doi: 10.1519/14833.1. [PubMed: 15574093]. 21. Miranda H, Fleck SJ, Simao R, Barreto AC, Dantas EH, Novaes J. Effect of two different rest period lengths on the number of repetitions performed during resistance training. J Strength Cond Res. 2007;21(4):1032-6. doi: 10.1519/R-21026.1. [PubMed: 18076244]. 22. Miranda H, Simao R, Moreira LM, de Souza RA, de Souza JA, de Salles BF, et al. Effect of rest interval length on the volume completed during upper body resistance exercise. J Sports Sci Med. 2009;8(3):388-92. [PubMed: 24150002]. [PubMed Central: PMC3763284]. 23. Senna G, Salles BF, Prestes J, Mello RA, Roberto S. Influence of two different rest interval lengths in resistance training sessions for upper and lower body. J Sports Sci Med. 2009;8(2):197-202. [PubMed: 24149526]. [PubMed Central: PMC3761475]. 24. Hiscock DJ, Dawson B, Donnelly CJ, Peeling P. Muscle activation, blood lactate, and perceived exertion responses to changing resistance training programming variables. Eur J Sport Sci. 2016;16(5):536-44. doi: 10.1080/17461391.2015.1071880. [PubMed: 26267339]. 25. Uchida MC, Nosaka K, Ugrinowitsch C, Yamashita A, Martins EJ, Moriscot AS, et al. Effect of bench press exercise intensity on muscle soreness and inflammatory mediators. J Sports Sci. 2009;27(5):499-507. doi: 10.1080/02640410802632144. [PubMed: 19253084]. 26. Crewther B, Cronin J, Keogh J, Cook C. The salivary testosterone and cortisol response to three loading schemes. J Strength Cond Res. 2008;22(1):250-5. doi: 10.1519/JSC.0b013e31815f5f91. [PubMed: 18296983]. 27. Schoenfeld BJ, Ratamess NA, Peterson MD, Contreras B, Sonmez GT, Alvar BA. Effects of different volume-equated resistance training loading strategies on muscular adaptations in well-trained men. J Strength Cond Res. 2014;28(10):2909-18. doi: 10.1519/JSC.0000000000000480. [PubMed: 24714538]. 28. Faigenbaum AD, Ratamess NA, McFarland J, Kaczmarek J, Coraggio MJ, Kang J, et al. Effect of rest interval length on bench press performance in boys, teens, and men. Pediatr Exerc Sci. 2008;20(4):457-69. doi: 10.1123/pes.20.4.457. [PubMed: 19168922]. 29. Ratamess NA, Chiarello CM, Sacco AJ, Hoffman JR, Faigenbaum AD, Ross RE, et al. The effects of rest interval length on acute bench press performance: the influence of gender and muscle strength. J Strength Cond Res. 2012;26(7):1817-26. doi: 10.1519/JSC.0b013e31825bb492. [PubMed: 22561970]. 30. Senna G, Willardson JM, de Salles BF, Scudese E, Carneiro F, Palma A, et al. The effect of rest interval length on multi and single-joint exercise performance and perceived exertion. J Strength Cond Res. 2011;25(11):3157-62. doi: 10.1519/JSC.0b013e318212e23b. [PubMed: 21993029]. 31. Willardson JM, Burkett LN. A comparison of 3 different rest intervals on the exercise volume completed during a workout. J Strength Cond Res. 2005;19(1):23-6. doi: 10.1519/R-13853.1. [PubMed: 15705039]. 32. Willardson JM, Burkett LN. The effect of rest interval length on the sustainability of squat and bench press repetitions. J Strength Cond Res. 2006;20(2):400-3. doi: 10.1519/R-16314.1. [PubMed: 16686571]. 33. de Salles BF, Simao R, Miranda F, Novaes Jda S, Lemos A, Willardson JM. Rest interval between sets in strength training. Sports Med. 2009;39(9):765-77. doi: 10.2165/11315230-000000000-00000. [PubMed: 19691365]. 34. Rhea MR. Determining the magnitude of treatment effects in strength training research through the use of the effect size. J Strength Cond Res. 2004;18(4):918-20. doi: 10.1519/14403.1. [PubMed: 15574101]. 35. Schoenfeld BJ. Potential mechanisms for a role of metabolic stress in hypertrophic adaptations to resistance training. Sports Med. 2013;43(3):179-94. doi: 10.1007/s40279-013-0017-1. [PubMed: 23338987]. 36. Hernandez Davo JL, Botella Ruiz J, Sabido R. Influence of Strength Level on the Rest Interval Required During an Upper-Body Power Training Session. J Strength Cond Res. 2017;31(2):339-47. doi: 10.1519/JSC.0000000000001512. [PubMed: 27253836]. 37. De Salles BF, Polito MD, Goessler KF, Mannarino P, Matta TT, Simao R. Effects of fixed vs. self-suggested rest between sets in upper and lower body exercises performance. Eur J Sport Sci. 2016;16(8):927-31. doi: 10.1080/17461391.2016.1161831. [PubMed: 27050709]. 38. Helms ER, Fitschen PJ, Aragon AA, Cronin J, Schoenfeld BJ. Recommendations for natural bodybuilding contest preparation: resistance and cardiovascular training. J Sports Med Phys Fitness. 2015;55(3):164-78. [PubMed: 24998610]. 39. Scudese E, Simao R, Senna G, Vingren JL, Willardson JM, Baffi M, et al. Long Rest Interval Promotes Durable Testosterone Responses in High-Intensity Bench Press. J Strength Cond Res. 2016;30(5):1275-86. doi: 10.1519/JSC.0000000000001237. [PubMed: 26466135]. 40. McKendry J, Perez-Lopez A, McLeod M, Luo D, Dent JR, Smeuninx B, et al. 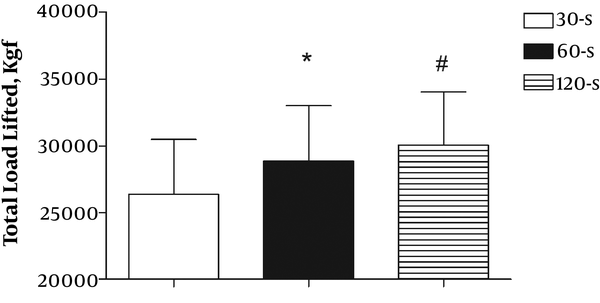 Short inter-set rest blunts resistance exercise-induced increases in myofibrillar protein synthesis and intracellular signalling in young males. Exp Physiol. 2016;101(7):866-82. doi: 10.1113/EP085647. [PubMed: 27126459]. 41. Cairns SP. Lactic acid and exercise performance : culprit or friend? Sports Med. 2006;36(4):279-91. doi: 10.2165/00007256-200636040-00001. [PubMed: 16573355]. 42. Rogatzki MJ, Wright GA, Mikat RP, Brice AG. Blood ammonium and lactate accumulation response to different training protocols using the parallel squat exercise. J Strength Cond Res. 2014;28(4):1113-8. doi: 10.1519/JSC.0b013e3182a1f84e. [PubMed: 23838978].